Ever since the 2020 Jeep Gladiator debuted at the LA Auto Show, everyone has been asking: “How much will it cost?” Now we know, and while it’s certainly not cheap, you get a lot of truck for your bucks. Here’s a comprehensive breakdown of how much you can spend on a Gladiator and how its pricing compares to other mid-sized trucks. If you saw “$62,310” and wanted to faint, that particularly high price is only for the limited run Launch Edition. Even the mighty Rubicon starts well below that, and to be honest the cheapest base model Gladiator is extremely good, too. Expect to see a full review next week, but the 285 horsepower, 260-lb-ft V6 (this powertrain is shared across the whole Gladiator “JT” lineup) manual transmission Sport trim like the one shown above is lovely. It comes with cloth seats, manual windows and door locks, single-mode air conditioning, 17-inch black steel wheels, black unpainted fenders, a plastic steering wheel, a 2.72:1 Command-Trac low range four-wheel drive system, Dana 44 front and rear axles with 3.73 gear ratios, 245/75 R17 Bridgestone Dueler H/T all-season tires, 5-inch touchscreen Uconnect 3 display, four and seven-pin trailer wiring, Class II bumper hitch (which has a plastic knockout if you want to install a ball), USB and USB-C and auxiliary port in the center stack, USB outlet in the center console, damped three-position tailgate, cargo lights, LED interior lights, halogen headlamps and fog lamps, two front tow hooks and one out back, folding soft top, push-button start, cruise control, eight-speaker audio system, storage below the rear seat, and lockable storage behind the rears seat. The next step up the pricing totem pole is the Sport S trim, which comes in at $38,240 (this, and all other base prices, include a $1,495 destination fee), which takes what’s standard on Sport and adds: 17-inch alloy wheels, power windows and door locks (including a power tailgate lock), remote keyless entry, automatic headlamps, tinted glass, heated power side mirrors, illuminated sun visors, and a leather-wrapped steering wheel. The Jeep Gladiator Overland can be thought of as equivalent to the “Sahara” trim on the Wrangler—it’s all about looking good and being comfortable. It gets body-colored fender flares, unique headlight surrounds and grille inserts, unique bumper trim, tubular side steps, 18-inch polished and painted alloy wheels, dual-zone climate control, additional LED mood lighting, seven-inch Uconnect 4 display, 115-volt outlet center console outlet, universal garage door opener, SiriusXM radio with one-year trial subscription, two USBs and two USB-Cs on the back of the center console, and a vehicle theft alarm. 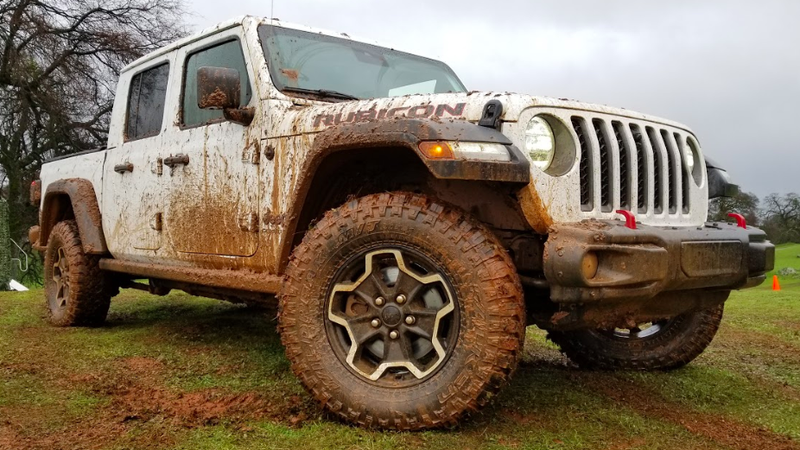 The Rubicon trim, as in the Wrangler, is all about off-road performance. For the most part, it gets what the Overland gets as far as standard features, with a few changes. It gets 4.10 ratio wide-track Dana 44 axles, electronically locking front and rear differentials, a front sway bar disconnect, 4:1 low range Rock-Trac transfer case, steel rear bumper, Fox monotube shocks, high clearance black fender flares, Rubicon-specific headlight surround trim and grille inserts, rock rails instead of tubular side steps, front skid plate, 285/70R17 Falken Wildpeak all-terrain tires on unique 17-inch wheels, two rear tow hooks, LED center console ambient lamp, and premium cloth seats. Below you can see all the available packages and their contents. The prices, Jeep told me, are essentially the same as the equivalent packages available on the JL. One that many folks might want to know is how much an automatic trans will cost—like on JL, it’s $2,000. That auto trans comes with Selec Speed Control, which is basically off-road cruise control. You can check out what some of these packages cost on the JL Build and Price. As for options that are different than the JL, there’s the Max Tow Group, which costs $995, and a regular tow group for $250. Then there’s a bedliner, which costs $495, and a tonneau cover that comes in at $495. That speaker costs $295. There are also auxiliary switches at the base of the center console that, unlike on the JL, can be optioned without having to choose a trailer tow group. They cost $295. Then there’s a Cargo Management Group, which gets a 115-volt outlet in the bed, a lockable and removable storage bin under the rear seat, and what are called Bed Trail Rails–basically sliding hold-downs. The group costs $895. Fully decked out, a Gladiator comes in at over 60 grand, and in fact, the Launch Edition—set to go on sale on April 4 and to be limited to 4,190—will cost $62,310. First, let’s look at the newest mid-size truck on the market in the U.S., the 2019 Ford Ranger. It comes with a fairly advanced and competitive powertrain—a 2.3-liter turbocharged EcoBoost inline-four that makes a claimed 270 HP and 310 lb-ft of torque, and that is mated to a 10-speed automatic. The base model with a five-foot bed, a SuperCrew (full four-door) cab, and four-wheel drive comes in at $31,875, and does have some comfort features that the base Gladiator does not—things like an automatic trans, power windows, and automatic headlamps. So if you want a cheap, decently powerful mid-size truck that can carry five people, the Ranger is obviously cheaper than the Gladiator by over 3 grand. Of course, you give up off-road capability and—a huge selling point of the Gladiator—the convertible top. It is worth mentioning, though, that for $1,295, you can add the FX4 pack to the Ranger which adds off-road tires, a rear locker, more underbody protection, additional tow points, and off-road cruise control. But if you add this to the base “XL” trim, you also have to add the 101A package including an alarm, power mirrors, cruise control, and a remote for the tailgate lock. This brings the price of a base crew cab off-road-ish Ranger to $35,300—that’s more than the cheapest Gladiator. Chevrolet has a truck that can, in many ways, compete with the Gladiator off-road—the ZR2. The base version of the ZR2 costs $43,995 and gets front and rear lockers, fancy shocks, all-terrain tires, a unique front bumper, a shield for the two-speed transfer case, rock rails, wheel flares, and more. The Bison package comes with unique steel front and rear bumper, heavy underbody skid plates, and AEV wheels for another $5,750. That truck comes in at $49,745—significantly pricier than the Rubicon Gladiator even with a steel front bumper. Of course, there’s also a less expensive, less off-road oriented Colorado—a four-wheel drive, crew cab, short box “WT” trim with a 308 horsepower, 275 lb-ft 3.6-liter V6. That truck appears to offer more comfort features than the Gladiator, with a standard power driver’s seat, a seven-inch touchscreen, and power windows and locks. It comes in at $32,795—well below the base Gladiator. So if you don’t need the off-road chops or the convertible roof, this is a cheaper V6, crew cab 4x4 pickup. Finally, there’s the old-timer in the segment: the Toyota Tacoma. With a 278 HP and 265 lb-ft V6, its engine is competitive, though its six-speed auto is old-school. An SR V6 Double Cab (four-door) 4x4 with a five-foot bed starts at $33,290, and is fairly spartan, though seemingly not as much as the Gladiator, as it does come with power windows and locks, and a 6.1-inch touchscreen. As for the big-dog off-road model, that’s the TRD Pro, and, among its features are skid plates, Crawl Control, Fox shocks, a locking rear differential, power moonroof, and a power sliding rear window. The TRD Pro Taco starts at $43,905, and you can slap a snorkel on it for another $725. So in the end, I wouldn’t say the Gladiator is “cheap,” especially if you care about interior comfort features. But considering it is convertible, and offers extremely good off-road capability on all trims, it’s really not too bad, either. Corrections March 30, 2019 10:45 A.M. ET: The Sport comes with under-seat storage, but the bin with the lockable lid costs extra on all trims. Bedliner is $495, not $250 as previously written. Correction March 31, 2019 12:20 A.M. ET: The Rubicon’s wheels are 17-inches, not 18-inches as written on Jeep’s website.